The much-visited original, which is placed in the Pope’s apartments of the Vatican, features a selection of history's creative geniuses, with philosophers, poets, mathematicians, astronomers, physicians and architects, all depicted in the celebrated work. A line-up of some of the past's most famous faces are included in the masterpiece, with Alexander the Great, Socrates, and Aristotle all portrayed in detail. Leonardo da Vinci poses as Plato, and Michelangelo is absorbed in a drawing on the artwork’s majestic steps. 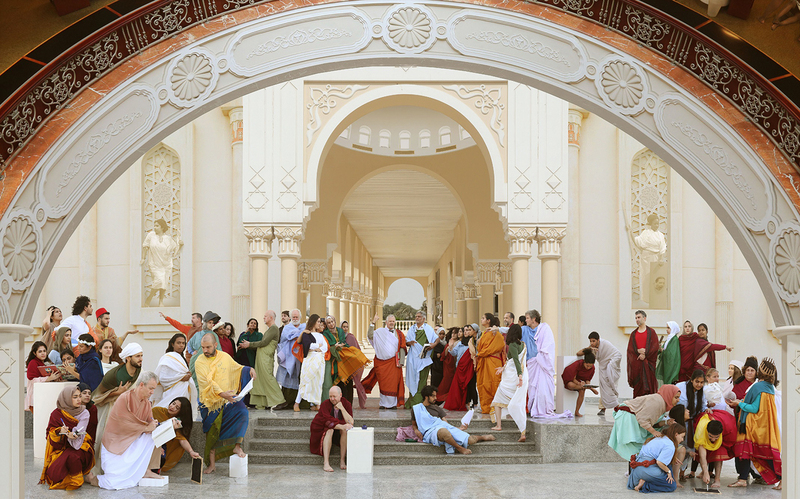 Led by a team of seven architecture students at the university, the re-enactment brought together 61 students, staff and faculty, all meticulously prepared to portray one of the many intellectual giants included in Raphael’s painting. Each participant’s costume was carefully designed to match their counterpart in the painting, and participants were coached on how to correctly duplicate the pose of the person they had been selected to imitate. Different parts of the grand architecture of the AUS campus were combined into a stunning backdrop for the work, with the AUS library atrium providing the impressive arch. The more time spent looking at the re-enactment, the more the level of attention and detail that has gone into the piece becomes obvious. To illustrate, if a viewer casts their eye to the top right-hand corner of the work, they will note a university professor lending a terrifying grimace to mimic Medusa on a shield held by Athena. The tableau was photographed by student Aashish Rajesh as a sequence of images, which were then knitted together digitally along with the backdrop. Graduate, Tasnim Tinawi, built the final image from a 5GB file of Photoshop manipulations. Redressing the Renaissance is more than a re-costuming event. The student-led initiative reforms male-dominant culture towards gender balance. It values cheerful cooperation over the cult of the solitary genius. It broadens euro-centric focus towards global inclusiveness. With tongue-in cheek humor, it honors traditional skills but enriches them with the marvels of contemporary technology. These and other considerations combine to make the "School of Athens in Sharjah" a contemporary artwork in its own right. "As architecture students with a keen interest in art history, we began analyzing and reinterpreting the art we so admire. It started out as a pleasurable pastime which evolved into a more meaningful endeavor. As much as the re-enactments were about generating significant images, we realized that the process itself created a sense of community that was more substantial than the final result. This, for us, redefined what we considered most important about the effort and its relevance to our experiences as students in this college." The seven students who led the project are as follows: Divya Mahadevan, Farah Monib, Zahra'a Nasralla, Uthra Varghese, Gopika Praveen, Tasnim Tinawi, and Nabeela Zeitoun.